God knows how the Vince Lawrence/Jesse Saunders Z-Factor album bypassed my radar for all these years but hell I am glad I have heard Thorns, its truly stunning! Someone posted it on a blog in 128 MP3 and the quality was not that good but I guess thats the sign of a classic track, it still sounds amazing even when its badly recorded! Anyway, I sadly won't get a chance to hear your rip of Thorns or the other Z-Factor track as both the links are dead...you know whats coming next...da..da..da...any chance of a repost?!? You ever hear the Fast Cars 12 Inch with the remixes of the track? The SFX mix is amazing, you can get it over at the Beat Electric blog...sure you will already have it but it does not hurt to mention it! 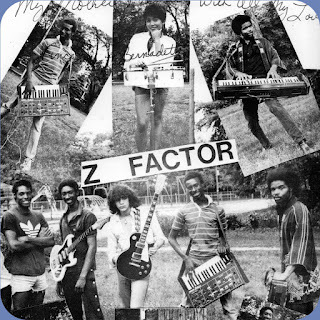 Thought I would say, I managed to find a decentish rip of the Z-Factor album so no worries about reposting the two tracks from it. Don't now how your rip compares to this one but here is the link to the Z-Factor "Dance Party Album" I came across(they must have spent hours over coming up with a title like that!). Its an amazing album isn't it! It reminds me in some ways of the 1983 Cybotron 'Enter' album. Though different musically, it has that same feel of experimentation as they wove a number of different styles of music together.